Identity the mistakes in the original quitclaim deed. Section 477.28 of New Hampshire's Revised Statutes sets out the required form of a quitclaim deed. Compare your deed with the statutory requirements and identify any and all areas where required information is omitted or incomplete. Obtain a blank corrected quitclaim deed form from your county recorder's office or an online legal document provider. If a corrected form is not available, obtain or download a regular New Hampshire quitclaim deed form and re-title it "Corrected Quit Claim Deed." Fill out the corrected quitclaim deed properly. 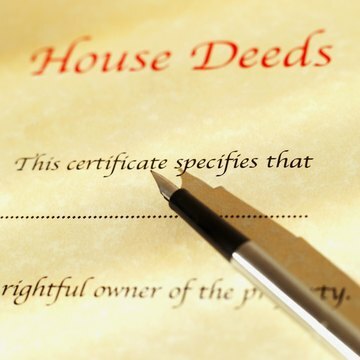 Provide a statement at the bottom of the deed expressly stating what was changed between the original and corrected deed. Execute the deed as required by law, signing it before a notary and having it notarized. Obtain the property recipient's signature before a notary, if it is also required. File the corrected quitclaim deed with your county recorder's office in the county where the property is located. Provide file stamped copies to your mortgage company and anyone with a legal interest in the deed, such as the person to whom you conveyed the original deed. Michigan couples, like couples around the country, must split their marital property when they divorce, including the marital home. Since a house can't be divided down the middle, couples sometimes decide to split the value of the home; one spouse keeps the home and the mortgage, while the other gets her share of the equity in the form of a buyout. The spouse who gets the buyout signs a quit claim deed to give the other spouse full title to the home.